Martin Scorsese has admitted that he would consider shooting all of his future films in 3D, following his experience directing Hugo. The legendary filmmaker, whose new 3D fairytale adventure opens in the UK this weekend, says that his 1970s classic Taxi Driver could have benefited from being shot in 3D. When asked by Deadline whether he'd consider going 3D-only, he said: "Quite honestly, I would." "I don't think there's a subject matter that can't absorb 3D; that can't tolerate the addition of depth as a storytelling technique. We view everyday life with depth." The admission from Scorsese, marks a stark turnaround from his previous position when he stated two years ago that he had no interest in making a 3D film. So what changed his mind? "Well, the story of Hugo," he said. "The climate of what Jim Cameron did with Avatar and 3D seemed right and the subject matter was just perfect for it. And it was time to take a chance with it." "(3D) shouldn't be limited to fantasy or sci-fi. Look at (Werner) Herzog's use of it (in Cave of Forgotten Dreams), Wim Wenders with Pina. "It should be considered a serious narrative element and tool, especially when telling a story with depth as narrative." When asked which of his previous films might have benefited from the 3D medium he said that The Aviator and Taxi Driver sprang to mind. "Taxi Driver, because of the intimidation of the main character, his presence is everywhere, a frightening kind of presence." Scorsese's eventual embracing of 3D should be considered a landmark for the medium. 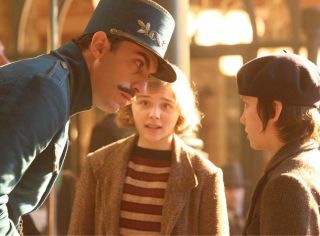 Critics are calling Hugo, the most important 3D movie since Avatar and are almost universal in their praise for the title.